Out of about 4.8 million people who filled out brackets online at espn.com, only 200 people correctly guessed the Final Four. That is 0.0046% of people were right. Crazy. And not one person has a perfect bracket. The last four teams are #1 #5 Michigan State, #5 Butler and #2 West Virginia. 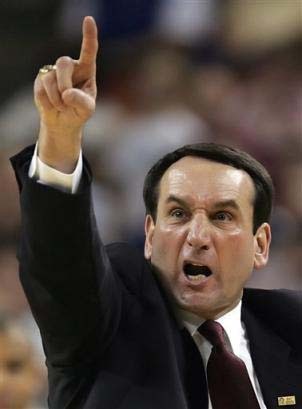 Duke is the only #1 seed left in the tournament. This is the first time they have made it to the Final Four since 2004: it is also the 15th time they made it this far and the 11th appearance under Coach K (only UCLA and UNC have had more trips). But it was not an easy ride, especially after Sunday’s game against Baylor. Baylor kept the blue devils on their toes as they went on a 10-3 run in the first half. Baylor, who had 28 wins all season, played a great game. They tied it up against Duke a few times, but couldn’t hold onto the lead as Duke turned 23 rebounds into points and made 15 out of 18 of the games last points. But give Baylor credit; they held Jon Scheyer pointless all game: not an easy accomplishment from this normally high scoring Blue Devil. West Virginia, who beat out the young Kentucky team is playing Duke next. The Mountaineers aren’t a team that is willing to let go of a game easily. They fight hard. Tough. Angry. Aggressive. This is also the first appearance in the Final Four in 51 years for Dub V. Coach Bob Huggins coaches smart basketball. They don’t rush and don’t seem to get phased when their opponents take the lead. The mostly junior and senior cast on this team understand how to end the game in their favor. The two teams that knocked out many people’s brackets are the other two teams to make it this far. The two #5 teams, Michigan State and Butler have been interesting to watch. 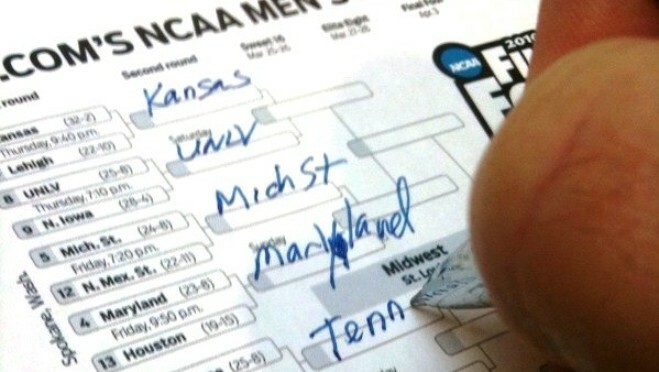 Michigan State somehow manages to sneak into the tournament it seems. They impressively have had six appearances in 12 seasons; how many people expected them to make it this far again? Mich St. also has made it far without their point guard Kalin Lucas, who tour his Achilles’ tendon in the second-round against Maryland, but the team has pushed through and torn up the court against Maryland, N. Iowa who took out #1 Kansas and beat out Ohio State. 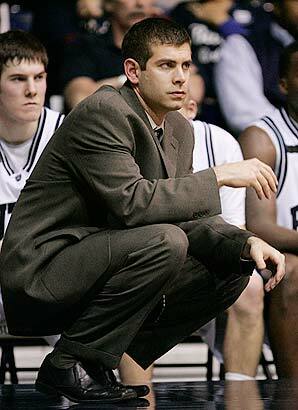 Butler ready to continue the magic to beat Mich State Saturday. 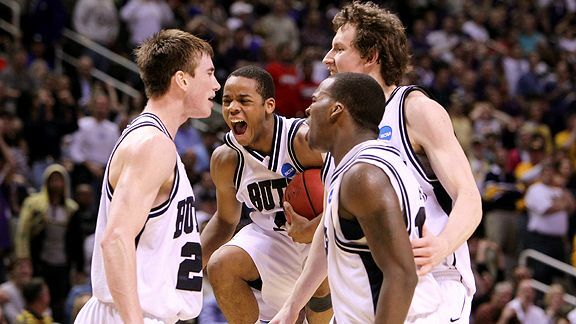 And Butler is the Cinderella story team of the year, and considering this team plays in the same arena as the team in the movie “Hoosiers”, a lot of attention has been put on the team that is six miles away from the arena they are about to play Mich. State. As I mentioned in my last post, this team has shown a lot to fear and this team will be playing in their home city. Again, the last team that had that happen was UCLA in 1972–when UCLA also won the whole tournament. What are some of your predictions for these last few teams? If you could start a new bet with just these four teams, who would you pick? I might add another contest if people seem interested since this years brackets were so whacked out. Many of you have already thrown away your brackets. A few of you have been so embarrassed by how you did, you don’t even want to watch the rest of the games. “I did something I promised myself I wouldn’t—I looked at my bracket which I haven’t done since the end of the second round. I’m out,” said a loyal follower of the sportaholic, Mark Huber. Do you feel this same sentiment? Well, don’t feel alone. This tournament brought an immense amount of upsets that there is not one perfect bracket left in America. Even that autistic kid in Chicago is out after his winning team, Purdue, lost to Duke last night during the last game of the sweet 16. But there is no denying the excitement, the energy and craziness this years tournaments have ensued. I don’t care if you are a basketball fan or not–it is games like these that make even the most anti-sports fan pause and actually get caught up in the yelling from the people standing in front of the TVs. I think the biggest game so far that had me going nuts was the Kansas State vs. Xavier game. This was the first double over time game played in a sweet 16 in over ten years and the combined points (101-96 = 197) is the second highest amount of combined points in a sweet 16. This game was intense. There were 17 lead changes. There were 13 ties. And there was eventually a winner decided about one in the morning on Thursday night. If you missed this game, I am truly sorry; games like this are why I got so into sports in the first place. The drama. The energy. The excitement and movement. The fast acting changing of who might win which changes just as much as the passing of the basketball itself. It is more climatic than any movie you might see in theaters. If you didn’t at least stop and see why this game was so insane, then you might as well stop reading now. Because a game like that is the best way anyone can ever get involved in sports. For those of you who are either stuck at work or too hungover from St. Patrick’s Day festivities and missed the first games of the NCAA men’s basketball tournament, you have missed some pretty exciting games. First big game and upset was #11 Old Dominion University over #6 Notre Dame in the final seconds. Final score was ODU 51-50. The luck of the Irish must have run out as the buzzer sounded, ending the Fighting Irish’s season. In double overtime, #7 Brigham Young University overcame the #10 Florida Gators 99-96. BYU advances to the next round as the Gators head back to Florida. In another overtime game, #2 Villanova barely escaped a scare by #15 Robert Morris by finally ending the game 73-70. In the biggest upset so far this tournament, #13 Murray State took #4 Vanderbilt’s chances of going further in the tournament as Murray State hit a buzzer beater winning shot, leaving the score 66-65. Number 3 Baylor went back and forth in another close game against #14 Sam Houston State; Baylor ended the game 68-59 over SHS. Currently, #10 St. Mary’s is trying to break their curse of losing in the first round as they have for the past four years in the NCAA tournament. With less than three minutes left, St. Mary’s keeps #7 Richmond Spiders at bay 70-59. Can they pull it out? Keep checking the site for more updates–and for those who joined my bracket challenge, at the end of this first round I will put up highest scores for each bracket.